"You are a dragonling. It is time to feel the wind beneath your wings and the scorch of flame in your snout. It is time for elves, knights, and dwarves to tremble; a time for orcs to have unhygienic habits; a time for arrogant wizards to be put in their place; a time to write your epic tale. Do well and minstrels will sing about your deeds for generations. Do badly, and you will not even have your name scrawled on the privy wall. It is time for your mighty deeds to be chronicled on your Dragonscroll." In Dragonscroll, players take on the role of young dragons, each trying to become the most infamous in the land. Each player has a number of Dragonscroll cards, containing tasks to increase their renown and add to their story. On a turn, a player draws and places a tile, which is added to the known world. These tiles may reveal enemies, such as wizards, elves and orcs; villages; or even lost royalty, optimistically eager for a lift home. The player then flies to a new location before raining fireballs down on any unsuspecting foes, using the flaming tower of death to determine where they land. At any point during his turn, he also has one bonus action, chosen from one of three double-sided cards. After choosing a bonus, the card is turned over, showing a different bonus action. A player may also eat three creatures to increase the number of fireballs he shoots. If a dragon manages to complete a task from one of his Dragonscroll cards, he may add it to his story. 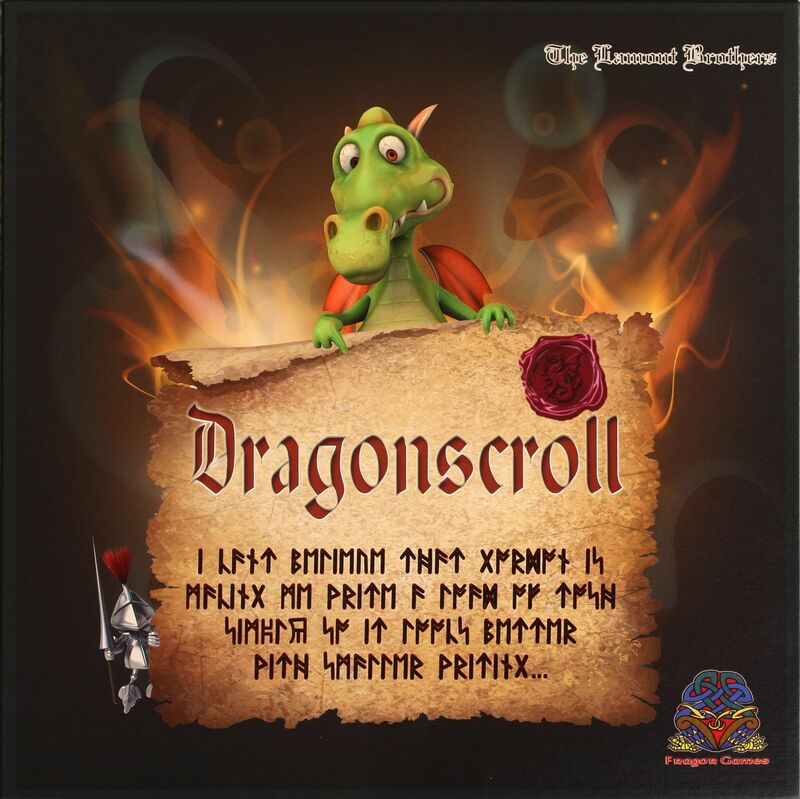 The dragon with the most illustrious story at the end of the game wins, and his tale will be recorded as Dragonscroll. Dragonscroll includes four dragon models and five buildings as the trademark large-scale Fragor components, in addition to wooden fireballs, wizard meeples, goat meeples, 64 large terrain tiles, 60 cards, and "a fireball flaming tower of death", dubbed the "Ball-ROG" by co-designer Gordon Lamont.